Products made in the technique of tape lace, look elegant and graceful. Of the individual strips may be connected openwork firmware, and complete parts and even a jacket or blouse completely. It is very important to combine beautiful ribbons. This can be done in several ways. - a needle and sewing thread to match the knit. About how you will seal the tape, think before knitting. It depends on the type of ribbon lace and all product made with this technique or not. Associate the sample 1 strip and look for it on Pico, arcs and other elements, through which you can discreetly hold a hook or needle. Knit tape, start with a full round of the motif. This motif will be placed at the top or bottom of the product - depends on your plan. If you make it down, several associated in the same direction and bonded together, the strips form a beautiful border. Deciding to attach the ribbon in the process of knitting, the following items tape lace knit according to the scheme, one way promazyvaya fully, and with another - not tavaziva 1 row. The number of rows in this part must be odd. Do not forget to attach the tape to the pattern. Treat yourself to a stay strip, whatever - along, across, or diagonally. 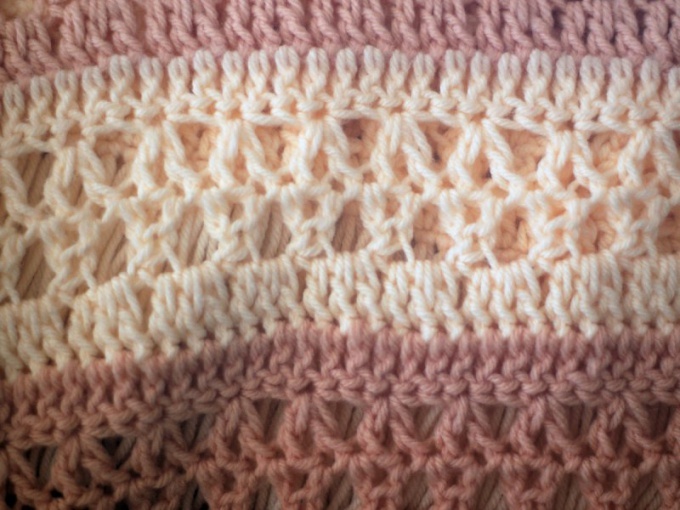 Details are converging in the right places with the help of short rows. Tie 2 strips without the last row. Fold together the 2 bands. It is completely knit in the edge of one should align with the edge of the second where you weren't dovedale 1 row. Attach the thread where you started knitting, and provarite unfinished number strip, adding at equal intervals the finished edge of the second tape. To do this it is most convenient to the most convex parts of one and another part. Dawasa row to the desired location, slide the hook into the Picot or arc the other tape, pull up a loop and provarite her from being on the hook with a simple column. If you attach the lace to the part performed by another pattern. mark this detail. Tie the knots of another color where the edge will be in contact with the convex part of the lace. Knit with dense detail, and not the tape. Strip connect exactly the same as in the first case. A lot in common with the technique of the band has crochet knitting products of the braid. This is especially important if an accurate pattern. Tie a piece of ribbon and lay it on the pattern. As a rule, knitted braid, there are "ears" - the arc of the loops on the sides. Having laid the braid and making the bend, proverite a chain of air loops and then drag it to an existing arc. In the same way connect the process of knitting and the rest of the "ears". Thus, you can associate the product to be very similar to bobbin lace. If the firmware is located in the middle part, not dokazivati 1 row on both sides. Thus knit, for example, the back of it. It is advisable to start it from the middle.